BSCI is the industry leader in the development of ultra-efficient energy management foams that are trusted by motorsports organizations around the world to protect their drivers. BSCI can replicate any seat insert or headrest in EIS W50 or EIS W18 ultra-light foam, both SFI 45.2 approved, with superior precision and uniform density that enhance the comfort level and safety of the seating system. 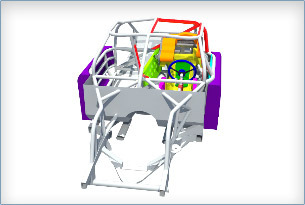 In as little as 30 minutes, the experts at BSCI can custom-engineer a seat insert to mold perfectly to the individual driver and vehicle for maximum comfort and performance. All BSCI products are manufactured in our own facilities and thoroughly tested to meet the most rigorous industry standards. Our protective materials and products are recommended by leading experts in crash safety.